Drs. 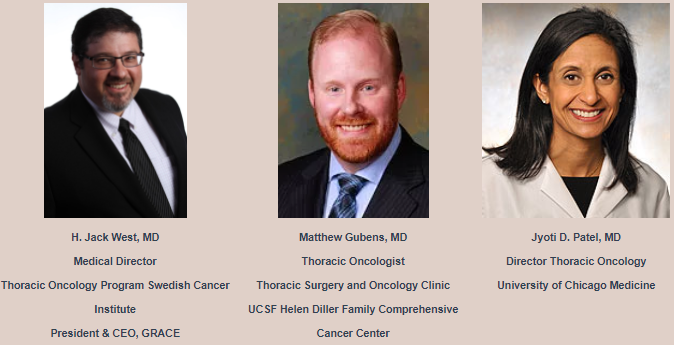 H. Jack West, Medical Director of the Thoracic Oncology Program at Swedish Cancer Institute in Seattle, Washington and President and CEO of GRACE, Matthew Gubens, Thoracic Oncologist at the Thoracic Surgery and Oncology Clinic of the UCSF Helen Diller Family Comprehensive Center in San Francisco, California, and Jyoti Patel, Director of Thoracic Oncology at University of Chicago Medicine gathered post meeting to discuss new information from ASCO 2017 regarding lung cancer. In this roundtable video, the doctors discuss Emerging Options for Malignant Pleural Mesothelioma.